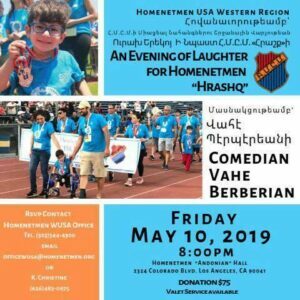 Homenetmen Hrashq Chapter will host a Comedy Night Dinner featuring comedian Vahe Berberian. It will be on May 10, 2019 at 8:00 pm at the Homenetmen Andonian Hall. This event will help secure funding to move the program to the next level including securing an Adaptive Physical Education teacher to provide proper support! Hrashq started with 20 athletes in March of 2018 and is now 36 athletes strong! As the number of athletes continue to grow, so will the need to purchase more equipment as well as to rent additional practice sites. Please join AAOP in showing our support to Hrashq by joining us all on May 10th.